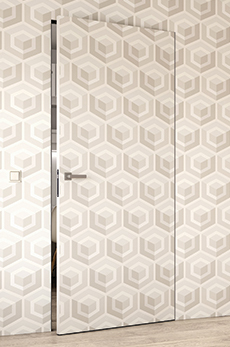 Non-traditional surface for doors which is very diverse. You can "dress" a door made of cardboard in a different appearance with each new painting of rooms or when changing the wallpaper. The surface is designated for the subsequent application of paint or pasting with interior wallpaper. A door made of cardboard is delivered in rabbet-free design to let its masking in the wall become apparent. ...these doors are suitable for less difficult spaces? They are rather used as a designer's cherry on the cake. They can be used in castles after the renovation of hidden hallways or for wardrobes hidden in the bedroom wall. to chemicals or humidity, they are at the very end of our spectrum. 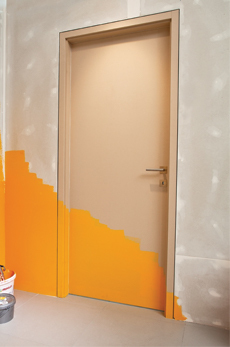 Which material is suitable for the apartment entrance door? 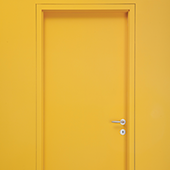 For this door we recommend veneer or artificial materials such as CPL and HPL which are a more resistant variant of laminate. Is it possible to undercut the door without a problem? Most models of SAPELI doors can be undercut with the exception of glass doors or a door with glazing to the floor, e.g. model Harmonie 40.